It seems like Blogger is acting a little funky today. I would like to announce that I have been accepted to be on the Sketchy Friday Challenge design team. Mrs. Sonia, designs her own images, sketches and they are AMAZING!! The team is broken up into two teams and I am on Team A, so I will be starting my term tomorrow!! I can't wait for you to see what I created. 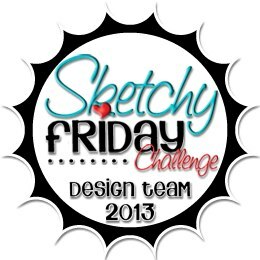 Make sure to stop by the Sketchy Friday Challenge and give a shout out to the rest of the team. Congrats on making this wonderful team! I can't wait to see your creations!